The stress response is the human body's reaction to anything that throws off the balance inside it—injury, infection, fear, exercise, or pain. The body reacts with an alarm phase, then a resistance phase, during which it tries to fix the imbalance, and then, if that fails, an exhaustion phase. The response starts when a part of the brain called the hypothalamus detects stress. The hypothalamus starts the alarm phase by turning on the sympathetic division of the nervous system. The sympathetic nerves release adrenaline. The "adrenaline rush" makes the heart beat harder and faster, raising blood pressure. A person's skin turns pale as blood vessels to the skin constrict and direct the blood to the muscles. Blood vessels to the intestines and kidneys also constrict. The liver releases stored sugar into the blood, hair stands up, and the body begins to sweat. The body's natural response is to run away or fight back; that's why the sympathetic system is called the "fight or flight" system. Next, the body must enter the resistance phase and fix whatever is causing this stress. If the body has lost blood from an injury, the kidneys can help minimize the loss. The hypothalamus makes the kidneys take water from the urine and put it back into the blood by releasing a protein called antidiuretic (which means "against urination") hormone (ADH). The adrenal glands (sitting right on top of the kidneys) can also make the kidneys move fluid from the urine back into the blood. But what makes them do it? It's the kidneys, located just below them. When the kidneys' blood supply is reduced during the alarm phase, they release a protein called renin (which means " kidney substance") into the blood. Renin reacts with other proteins in the blood to form angiotensin (which means "blood vessel constricting"). When angiotensin reaches the adrenal glands, their outer layer, the adrenal cortex, releases the hormone aldosterone. Aldosterone makes the kidneys secrete potassium into the urine and reabsorb sodium and water into the blood. This helps maintain blood volume. The hypothalamus and adrenal cortex work together in the resistance phase to replace lost blood volume and send food to damaged cells. As the stress continues, the body uses up its stored glucose . It will need to use its stored carbohydrates , fat, and proteins for energy and to heal damaged cells. Once again, the hypothalamus and adrenal glands tell the body what to do. The hypothalamus releases growth hormone and the adrenal cortex releases cortisol. Both of these hormones tell the body to release stored compounds from body fat, muscles, and the liver. In this case, the adrenals get their orders to release cortisol from the hypothalamus when it releases a protein called corticotropin (meaning "cortex stimulating") releasing hormone (CRH). The hypothalamus does not affect the adrenals directly. Instead, the CRH goes to the pituitary gland, just below the brain. The pituitary sends the message on to the adrenals by releasing adrenocorticotropic (meaning "adrenal cortex stimulating") hormone (ACTH). This chain of command, in which the hypothalamus tells the pituitary what to do, and then the pituitary tells the adrenals, is called the hypothalamic-pituitary-adrenal axis. 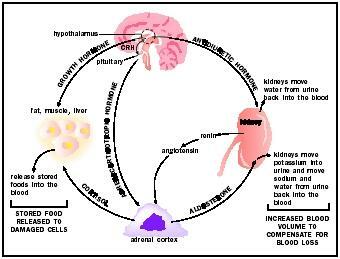 When ACTH reaches the adrenals, the adrenal cortex releases cortisol into the blood. Cortisol makes the body release stored chemicals into the blood. With ADH and aldosterone helping the body preserve blood volume, and cortisol and growth hormone providing food for the cells, the body should recover. But if this isn't enough help, the body could become exhausted and suffer organ damage. Long-term or chronic stress can keep the body's stress response too active. That can cause high blood pressure by increasing blood volume. It can make the body lose too much potassium in the urine or develop high blood sugar levels. Also, cortisol suppresses the immune and inflammatory systems (that is why the similar compound cortisone is used to treat rashes). With high cortisol levels, the body has trouble fighting off infections. Stress even makes some animals more prone to cancer. The stress response helps saves the body from life-threatening injury, but it may need to be controlled with medications, biofeedback, or meditation to keep it from causing new illnesses or complications. Martini, Frederic H. Fundamentals of Anatomy and Physiology. Upper Saddle River, NJ: Prentice Hall, 1998. Porth, Carol M. Pathophysiology: Concepts of Altered Health States. Philadelphia, PA: Lippincott Press, 1998.